Sally Thibault Sally Thibault is a Life Strategist, Professional Speaker, Author of two books, ‘David’s Gift’ the true story of her family’s journey following her son’s diagnosis of Asperger’s Syndrome, and ‘Tapping to Reclaim You – How to reignite your passion, power and purpose in 30 days.’ As an EFT Master Trainer and Creator of…. Sigrid de Kaste 3x #1 Best Selling Author Sigrid de Kaste, is the Founder and Director of Stickybeak Marketing. Having formally studied marketing, she has direct experience of starting, building, and selling businesses; and has a comprehensive knowledge of the different types of marketing required for each stage. In building her own businesses, Sigrid discovered…. Tanya Sava Tanya Savva is Wellness Coach, author and speaker who is passionate about empowering mothers to reconnect with the essence of their true self, free of self-limiting beliefs and perceived barriers, so they can live a life full of abundance and joy. She is a single mother to her daughter, Mackenzie who is blind,…. 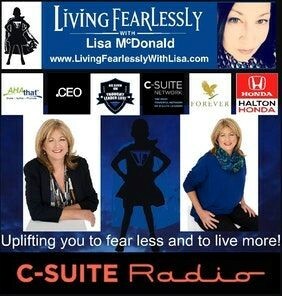 I was showcased on the Living Fearlessly radio program with Lisa McDonald! We talked about living fearlessly and overcoming adversity. This is what Lisa McDonald had to say about my experience… A brilliant powerhouse with decades of experience under her belt as an expert in sales with multi-million dollar businesses, while also earning her spot…. Teena Hughes In an effort to help more women be found online, Teena Hughes has written and published a book titled, “50 Marketing Secrets of Successful Women”. Through the generosity of businesswomen and artists worldwide, 50 marketing secrets are presented in the book with step-by-step processes so the reader can achieve marketing steps in bite-size….